Wedding bands are exchanged when the couple says I do, and they are worn daily for a lifetime. A wedding band is a circle, symbolizing eternity. It is a symbol of everlasting love. 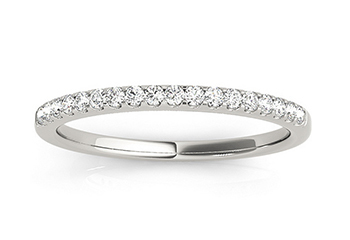 For Women, wedding bands can complement the engagement ring, or they can match exactly. Men wear just the wedding band on its own. Learn a little more about the four main types of wedding band choices: Plain gold bands, diamond accented wedding bands, eternity wedding bands and matching engagement ring and wedding band sets. 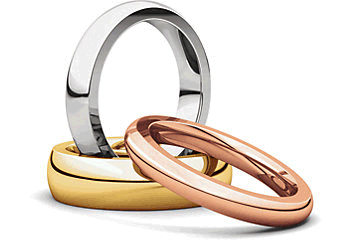 The traditional or plain wedding band or ring combo for both men and women is certainly a classic. Plain is an understatement, though these may be simple in design and material, they are far from plain or boring. Traditional bands typically come in either gold or platinum. This can be white or yellow gold or even rose gold and these rings are stunning. A traditional band typically does not have any diamond or other stone accents but can have beautiful engraving that is either on the face for presentation purposes or on the interior of the ring for a very special touch. .
We live in an age where Diamonds and diamond accents on rings are more accessible and affordable than ever before. Accents are also a fantastic way to spruce up an engagement ring that may be plain for a beautiful look. You can choose an accent that has a few stones or one that wraps the entire band to make a beautiful statement. 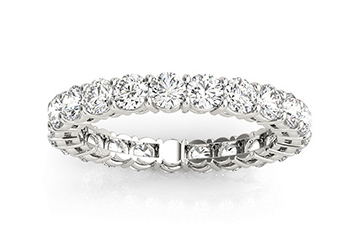 Eternity bands are another stunning option. These rings are a complete circle of Diamonds that are either all the same size or that are smaller accent stones. Eternity bands are a fantastic option if you are looking to up your current set or make a statement for an anniversary or special occasion. Eternity bands can be added to current ring stacks to create a high impact look or can be worn alone for an understated and stunning style. Eternity bands are an absolutely beautiful option for women that want something that is going to be delicate and beautiful but also impactful. The beauty of the diamond is that it can be cut to suit your style. Whether you're bold, elegant or sophisticated, you'll find a diamond shape that shows off your personality and highlights your best qualities.